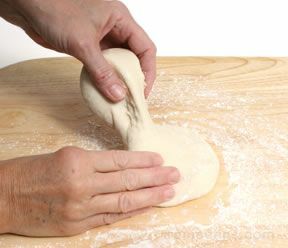 A traditional method of leavening bread using a small piece of dough from the previous batch of bread to create a starter dough for the next batch. The small piece of dough should be removed after the rising period and stored it in a covered bowl in the refrigerator for two days. When it is ready to be used, allow it to rest at room temperature for two or three hours. If the old dough will not be used within a few days, it can be frozen for up to six months. It should be loosely wrapped in wax paper followed by a wrapping of foil. When it is ready to use, it should be thawed in the refrigerator overnight before bringing it to room temperature.